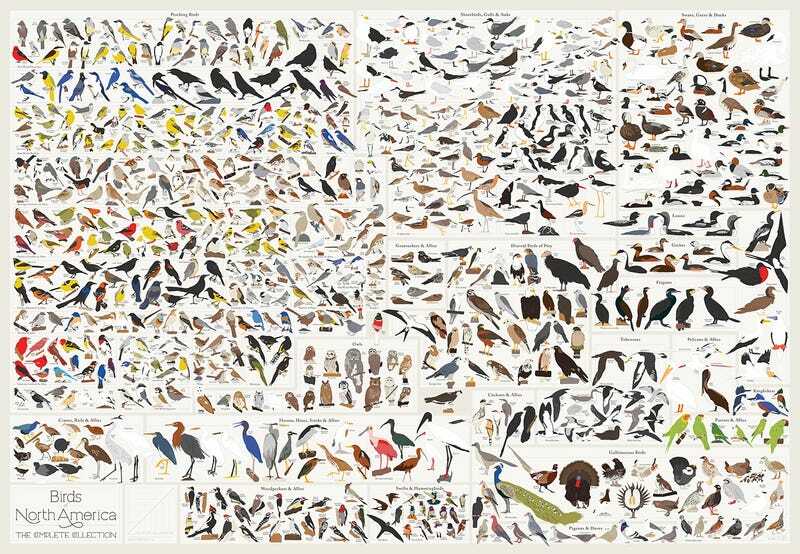 Whether you’re a bird lover or a data fiend, this poster will please you immensely. The latest creation from the data maniacs at Pop Chart Lab, “Birds of North America” contains every species of bird you can see in this part of the American continent, beautifully drawn. I even identified the Mexican scrub jays in my backyard by using it! The product of over 400 hours of intricate illustration work by our talented team of artists, this unabridged aviary features over 740 fair-feathered friends drawn to scale and sorted by species, covering the continent’s complete avifauna (as designated by the National Audubon Society and the Cornell Lab of Ornithology) from common sparrows, jays, and owls to rarer birds such as the Greater Sage-Grouse, the California Condor, and the Whooping Crane. We’re attracted to projects with big data sets and a sort of built-in, pre-established beauty, so organizing and drawing birds, in all their plume-heavy glory, was a no-brainer for us. We mined images from a number of really comprehensive sites, but hewed pretty closely to the archives of the National Audubon Society and the Cornell Lab of Ornithology, whose species-illuminating articles we used to give taxonomical shape to the poster. In a handful of instances, we made decisions to combine birds that are rarely seen and sometimes confused with each other, since there’s little visual evidence to differentiate those species. Those are mostly birds from Hawaii, which itself is physiographically hazy and occasionally argued as separate from North America-proper. You can order the poster for $38 at Pop Chart Lab.